We had pulled pork sandwiches and homemade mac-and-cheese for dinner this weekend. Get out your crockpot and get cooking. – Put pork in crockpot. Mix Seasoning, ketchup, brown sugar, and vinegar until blended. Pour over pork. Cover. – Cook 8-9 hours on LOW or 4-5 hours on HIGH. There are many easy sides for this – Mac-and-cheese, corn on the cobb, baked beans, potato salad…. This was quite tasty and easy to make. You can alter it to your liking as well. For Tom, Lucy and I it was just the right amount. You could double the recipe and do a second layer before baking. Take one package of raviolis and prepare according to directions. Under cook them a bit. Pour a layer of your favorite sauce in a baking dish. Prepare a meat sauce while the raviolis cook. You could use cheese, mushroom, or spinach ones. Place the raviolis in the dish then pour on the meat sauce or plain sauce if you prefer it meatless. Sprinkle a layer of baby spinach and cover with Italian cheese. Bake until cheese is melted. Serve with some italian bread and enjoy! With Thanksgiving on the brain, I figured I’d share a recipe I tried out last night. I saw it posted a few weeks ago and had drooling over the thought of making it for far too long. Who doesn’t love chocolate chip cookies or pie? So, why not have them together! Click here for the recipe and pictures that will have you running for the grocery store. It will be made often in our house – YUM! There is something great about a brisk fall day. Fall in New England is a magical time. I love the fresh air and the changing leaves. Lucy and I have been enjoying the park before it gets too cold. 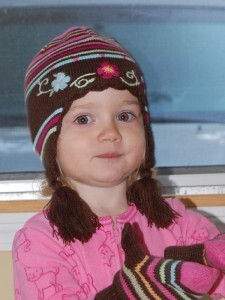 And in preparation of the impending chilly weather, Lucy decided to try out her new hat and mittens. And with fall comes lots of great food. I hate too cook when it is too hot in the house. So now that it’s cooler, I have plans for lots of yummy dinners. At the moment, I am baking Mini Banana Chocolate Chip Muffins. (I added cinnamon to the recipe in the link.) And tonight for dinner I am making Caramel Apple Pork Chops! I’d love to hear about your favorite fall recipes! Thank Susan for the one above. Meanwhile, heat a skillet over medium/high heat with a couple tablespoons of olive oil. Salt and pepper the chicken and add to the pan. Cook for about 10 min or until chicken is no longer pink. Remove the chicken from the skillet and add a couple more tablespoons of olive oil to the pan along with the butter. When the butter is melted, add the chopped garlic. Saute for 2-3 min to cook the garlic. Pour garlic butter over the pasta and spinach and toss in the chicken and chopped tomato. Toss to combine all the ingredients. Add additional salt and pepper as needed. Top with a sprinkle of Parmesan cheese. Enjoy!